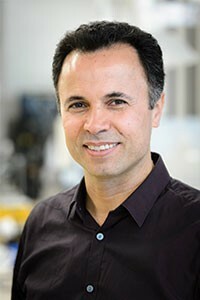 Dr. Madjid Mohseni is a professor in the Department of Chemical and Biological Engineering at the University of British Columbia. Research in his laboratory focuses on water quality and the application of advanced water treatment processes to improve the quality of drinking water. In particular, he works on the development, evaluation, and implementation of advanced oxidation processes (AOPs), particularly UV-based AOPs, ion exchange, and electrochemical processes. Dr. Mohseni’s research involves laboratory scale development and investigation, as well as pilot scale and field evaluation of the technologies under real operating conditions at several partner community sites. His team aims to not only advance the science behind water treatment technologies but also to offer communities and industries more efficient and cost-effective technologies to reduce pollution and protect human health and the environment.